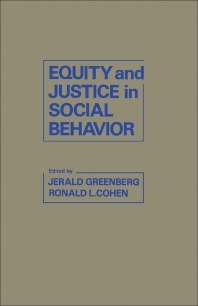 Equity and Justice in Social Behavior provides a critical assessment of the social psychological knowledge relevant to justice. This book illustrates how the broad concept of justice pervades the core literature of social psychology. Organized into 12 chapters, this book begins with an overview of the primary justice theories and identifies some of the focal issues with which they are concerned. This text then provides the necessary theoretical background for the study. Other chapters consider the various individual difference variables known to affect adherence to social justice norms. This book explains as well how the perceived causes of justice affect attempts to seek redress, and how actors and observers diverge in their perspectives about justice. The final chapter deals with the normative and instrumental interpretations that have been offered to explain justice behavior. This book is a valuable resource for social psychologists, social scientists, philosophers, political actors, theorists, and graduate students.